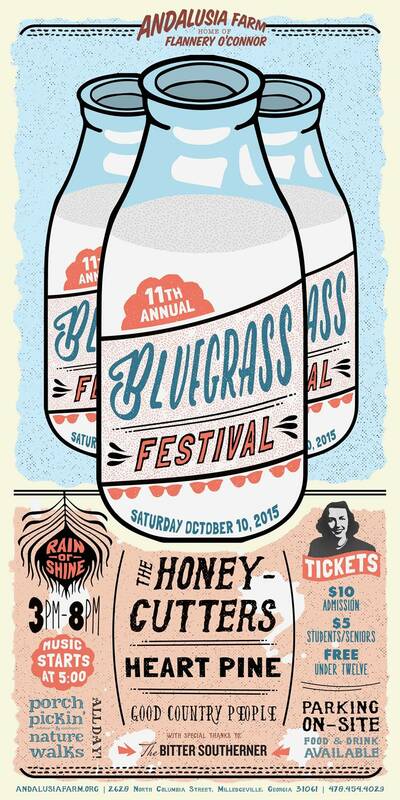 The Honeycutters headline the all-ages event in Milledgeville October 10. While Flannery O’Connor probably could not have imagined her backyard overtaken by hundreds of banjo enthusiasts, it’s safe to assume she wouldn’t have minded. The author, confined by illness to her family farm in Milledgeville during her last years, was famously hospitable, inviting friends and strangers and especially peacocks to keep her company on the 500-acre estate. She hosted a regular reading group out on the wide, front porch. Next weekend, as part of Andalusia’s 11th Annual Bluegrass Festival, amateur musicians will take to the various porches on the grounds for two hours of organic finger-pickin’ before the featured acts take the stage. The headliner for the October 10 event is Appalachian honky-tonk group the Honeycutters, based out of Asheville, with openers Good Country People (named after O’Connor’s short story) from Macon and Milledgeville’s own Heart Pine. Porch pickin’ takes place from 3 to 5 p.m., after which the bands perform. Two 45-minute guided nature walks, at 3 and 4 p.m., will illuminate the farm’s history, plants, and wildlife. Admission is $10 for adults, $5 for students and seniors, and free for children under 12. Milledgeville’s Old Clinton BBQ, Top Dawg Growlers, and Doodle’s Cupcake Bakery will be on hand to keep patrons refreshed, but attendees are encouraged to bring their own picnics along with chairs, blankets, coolers, and flashlights. Leashed pups are welcome, too. The main house, which operates as a museum, will be open that day from 10 a.m. to 5 p.m.
For more information visit andalusiafarm.org/bluegrass-festival.